Hi, everyone! I've shared recipe posts with you all from time to time, and I'm bringing them back - on Tuesdays you'll find a new recipe from me...some will be fun, some will be quickie recipes and some may seem a little intimidating. But trust me, if I can make 'em, you can! Call me uncivilized but until RadioMan and I moved to the NorthCoast, I had no idea people did things with grapes other than 1) eating straight from the bowl or 2) as grape jelly/jam. Color me surprised when someone brought a Concord Grape Pie to a church supper...and even more surprised when I tasted how good it was! Preheat the oven to 400 degrees. Wash the grapes and remove the skins, placing the skins to the side. In a large saucepan, place the cleaned grapes, mashing a few at the bottom. Cook over medium heat until the grapes are boiling. Remove from heat and press the grapes through a food mill to remove the seeds. Now, put the skins into the pan with the grape pulp, along with the lemon juice and mix well. In a separate bowl, mix the flour, sugar and salt. Mix in the grape mixture until well blended and pour into the pastry crust. 'Dot' the butter over the top of the pie filling and then cover with the second pastry shell. 'Flute' the edges and cut slits into the top so the filling can vent as it cooks. Bake for 45 to 50 minutes, until the crust is a golden brown and the filling is bubbling through the top shell. Allow it to cool and then serve. I love recipes! I'm not going into how I feel about grapes , but I do love recipes! hahahahaha, Liz! I love grapes - fresh off the vine, from the freezer, as jelly...I wasn't sure about grape pie at first, but now it's a keeper, too. I've never had grape pie-gonna have to try this! Thanks for sharing, Kristina! you're welcome - hope you like it, Jennifer! 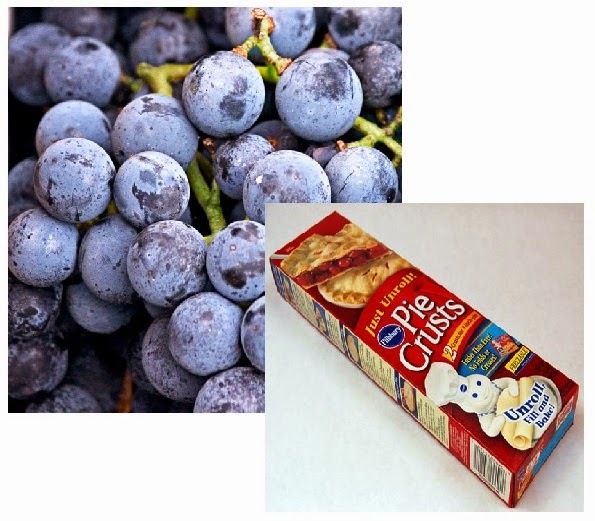 I never heard of grape pie. That's a new one for me. I wonder if I could talk my DH to try making that. Thanks for the recipe.